Diwali 2014 is finally here. 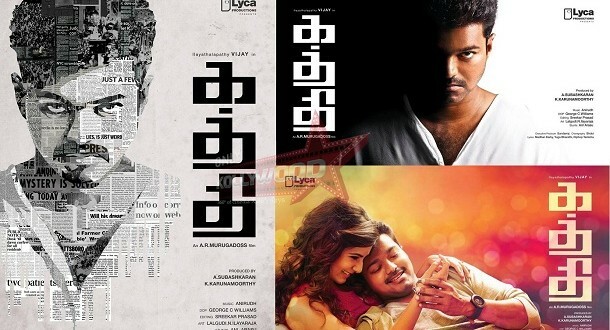 The two Tamil releases are Ilayathalapathy Vijay's Kaththi and Vishal's Poojai. For the first time in many years Kollywood will only see two Tamil releases for the festival of lights. The AR Murgadoss directed Kaththi after all its controversies is finally getting a smooth release, after its makers agreed to abide by the request of those agitating against it. The film is releasing in nearly 450 screens in Tamil Nadu and has managed to get entertainment tax waiver. The other big release is Vishal's Hari directed Poojai, a typical mass family entertainer. The film has also got nearly 325 screens in Tamil Nadu without any problem. Since it is a UA certificate, was not eligible for tax exemption. Kaththi advance booking was phenomenal . 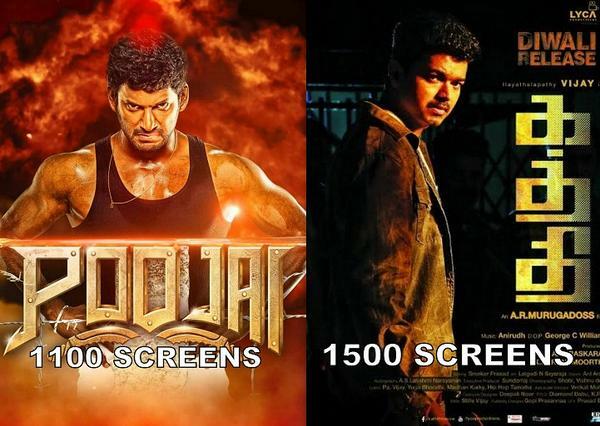 Both the films have started in Tamil Nadu with early morning shows. It looks to be a cracker of a Diwali for Kollywood. A R Murugadoss's 2012 Diwali release Thuppakki, broke many records and went on to become one of the highest grossing films in Vijay's career. Exactly two years later, the duo return with yet another action thriller titled Kaththi, hoping to create an even bigger sensation. The film has been steeped in controversy with allegations of plagiarism and linking the producer Subaskaran Allirajah of Lyca Productions with Sri Lankan president Mahinda Rajapaksa. The teaser of the film, which was released on Vijay's birthday, crossed two million views on YouTube. Anirudh's music is already the rage among youngsters, especially the Selfie Pulla and Pakkam Vanthu number. The film has Vijay essaying a dual role with the hot and happening Samantha Ruth Prabhu playing the female lead. Director Hari is undoubtedly the master of commercial potboilers. His biggest strength is his racy screenplay that is loaded with action, emotion, romance and comedy, ensuring there is never a dull moment in the film. Hari's latest offering, Poojai, starring Vishal and the ultra glamorous Shruti Haasan, promises to be yet another mass entertainer. The film has music by Yuvan Shankar Raja and is produced by Vishal himself under his home banner, Vishal Film Factory. After the massive success of Singam and its sequel Singam 2, much is expected from Hari's Poojai. Also releasing this Diwali is director Praveen Gandhi's Puli Paarvai. 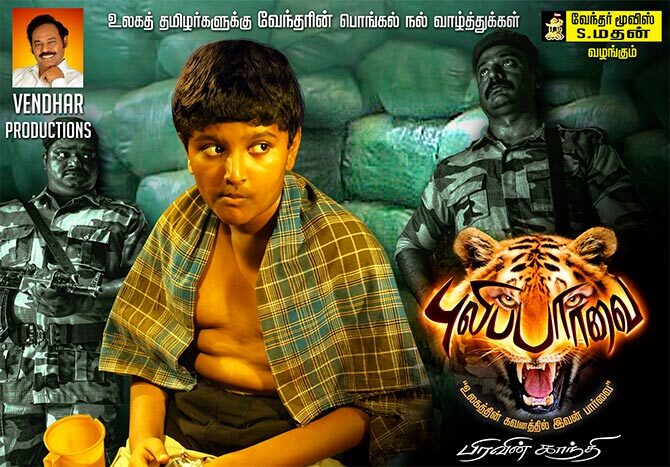 The film is inspired by a TV documentary on Balachandran, the 12-year-old son of LTTE leader Velupillai Prabhakaran. Apparently, the image of the youngster eating a snack minutes before being allegedly shot dead, moved the director to make the film. Some organisations and political parties believe the film portrays the LTTE and its slain leader in poor light, and are opposing its release. Child actor Satya Dev essays the role of Balachandran in the film. Iravum Pagalum directed by Bala Sriram is yet another Diwali release. The film features Mahesh of Angaadi Theru fame and Ananya, who gave an admirable performance in Engaeyum Eppothum, in the lead roles. A romantic thriller, Iravum Pagalum is produced by Balasubramaniam Periyasamy under the banner Sky Dot Films.